The Morotabune Ritual is a Shinto ritual taking place in Mihonoseki harbour re-enacting a famous episode of the Kojiki, “Records of Ancient Matters”, written 1300 years ago. The Kojiki is regarded as one of the most important records of the early history of Japan and includes well-known myths, many of which are set in Shimane. 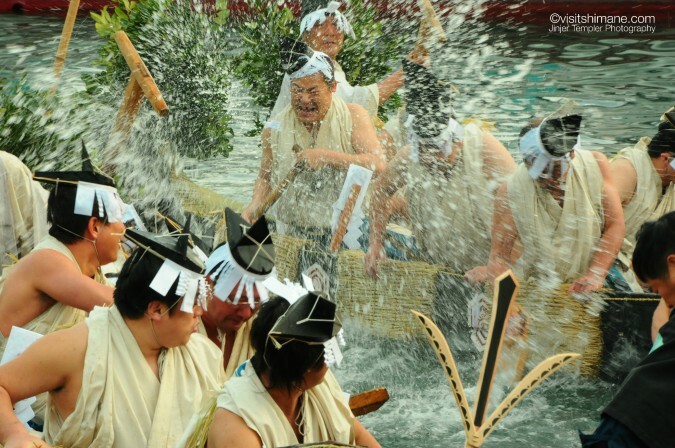 The Morotabune Ritual mainly consists of a race between 2 boats with the rowers wearing traditional clothes. It is based on the Kuni-Yuzuri Myth about the deity Okuninushi – original ruler of the Izumo province and now worshipped at Izumo Taisha Grand Shrine – asking the messenger sent by the Sun Goddess Amaterasu to go and ask his son Kotoshironushi about conceding their lands to the gods of ‘Heaven’. Kotoshironushi was living in Cape Miho and the heavenly messenger, called Takemikazuchi, had to go all the way from Inasa-no-hama beach (where Izumo Taisha is now built next to) to the tip of Cape Miho, so he decided to go there using a dug-out canoe. Morotabune Ritual is a reenactment of the messenger coming to Kotoshironushi. Morotabune actually means ‘boat with many hands’ and suggests the idea of a boat sailing quickly. Eighteen people boarding two boats row out to sea. They row to the east mouth of Mihonoseki harbour to reach Marōdo shrine dedicated to Okuninushi. The boats then return with haste to the harbour a number of times, competing against each other, before the sailors start performing prayers. 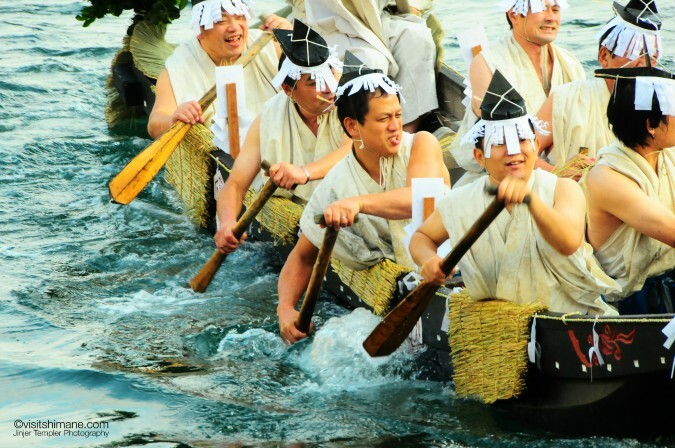 Performed annually on December 3rd, the boat race is just one of many rituals performed during this day. The boat race starts in the early afternoon and reaches its peak around 2pm. 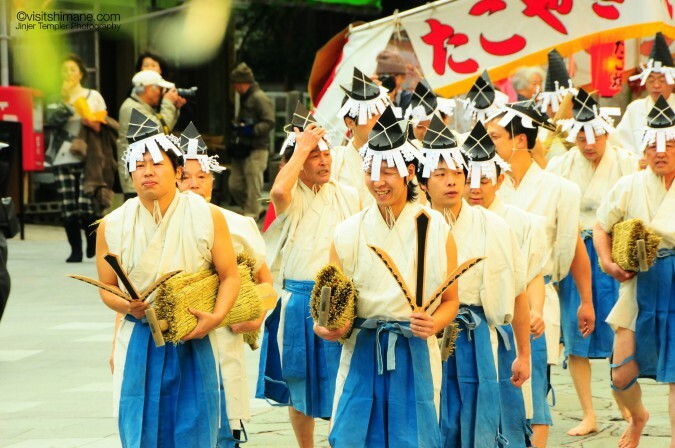 ※This ceremony has very close relations with the “Aofushigaki Shinji” performed every April 7th in Mihonoseki. After Kotoshironushi agreed to concede the lands, he disappeared from the visible world by going into the sea. Kotoshironushi is also known as Ebisu, the god of sea and trade, and Miho Shrine is the head of approximately 3000 shrines around Japan dedicated to Ebisu.